Earth’s Firmament, its ‘expanse’ as the Hebrew puts it. Earth’s sky or atmosphere IN which and UNDER which there is water. Galacti is taking all of this knowledge about Genesis in and, amongst others, two thoughts are befuddling him at this point: Apparently, no human exists until day 6 so there really isn’t any eyewitness information prior to this. So where does this account come from and what can its value be? Secondly, there are but a few words covering major phenomena, for instance, night and day involve the movements of the Earth, Moon, and Sun. These biblical explanations just seem too simplistic. Galacti’s observations are correct on both accounts and merit an explanation even a lengthy one, but we will keep it short. In the New Testament Jesus’ words (we will be getting to Him in more detail later on) indicate Moses, one of the most prominent Old Testament figures as the author of The Law (Luke 24:44) which includes the book of Genesis. But, obviously, he was not an eyewitness having lived hundreds of years after these events. We could now open a chapter, or even a book, about how the Bible was written and put together, a subject known as canonization. We won’t suffice is to say that just as you do not yet have the final picture composed of the pieces we’re putting together, similarly you’ll have to take the written word for what it says right now, or consider it a story. Just daily chronicles as pieces of the puzzle. Give it time, plenty of time, and take it one step at a time. There is a biblical answer to Galacti’s uncertainty and reservation. ‘Through faith we understand that the worlds were framed by the word of God, so that things which are seen were not made of things which do appear’ (Hebrews 11:3). There are processes and thing that just cannot be scientifically proved, that’s where the element of faith comes in. Where does faith, or belief, come from? Paul answers ‘So then faith cometh by hearing, and hearing by the word of God’ (Romans 10:17). You believe that 30,000 strange looking car parts in a warehouse can be assembled as a fully working car. Maybe you’ll have a little more faith, in what can’t be proved when you see the parts of the Bible puzzle come together to form a coherent picture of planet Earth with humanity and how to reach peace and prosperity… I consider my role, that of The Explanation, as simply letting you hear the word of God. More likely read but maybe I’ll get into video and podcasting and you will be able to literally hear the word of God as well. This brings us to the second point. The simplicity of expressing the creation. The simplicity of E=mc2. The most complex presented in the most minimalist, clear-cut terms. Mathematicians talk about the beauty and poetry in equations. We can mention Occam’s Razor here: A law of parsimony, of economy or of succinctness … why do we want to complicate matters? Let me add another point I will expand on at the end of Genesis chapter 1. This is like the time and place-setting of a movie. In the first scene it zooms in on a city or a ship or through an apartment window … so you know where you are. It might even have text: Paris 1936. This short expose in Genesis 1 is simply to set the time (after the chaos caused by the downfallen Lucifer) and the place (on a restored Earth), revealing the props on stage and how they got there. All it does is set the stage. That’s somewhat simplistic because, as we’ll see, it’s quite a stage. In this creation story, we are being given practical facts with expressive vocabulary. 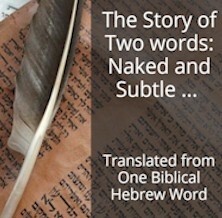 The Hebrew wording as we have seen and will continue to see is expressing both physical and spiritual concepts. Two for the price of one. Technically and spiritually correct. The 2nd-day account is another example of this brevity with spiritual overtones. 6 And God said, Let there be a firmament (H7549 expanse of the sky) in the midst of the waters, and let it divide (H914) the waters from the waters. 7 And God made the firmament (H7549), and divided (H914) the waters which were under the firmament from the waters which were above the firmament: and it was so. 8 And God called the firmament Heaven (H8064 שָׁמַיִם shâmayim shaw-mah’-yim). And the evening and the morning were the second day. What we have here is a clear separation of the water (the Hebrew for divide (בָּדַל bâdal) is identical to dividing light from dark in verse 4). We have a concise but very distinctive description of the delimitations of water on Earth and water in the sky (see Further Study below). This perfectly reflects the reality of the role water plays in Earth’s environment today and in the past. Are you hearing the reality as Paul said? How does Science explain the origin and disposition of water? Furthermore, there’s an important zone between these two watery expanses that cannot go unmentioned. That zone where mankind can live in tranquillity. Imagine living in a continual mist, some areas of Earth, like Grand Banks in Newfoundland, Canada, do have extreme humidity and even mist making daily chores more arduous. Referring back to the water cycle we expanded in Chapters 4 of both Inventory of the Universe and Audit of the Universe, these two expanses (on Earth and in the atmosphere) cover the entire water system of earth with all the intricacies of their interdependent processes like evaporation (heading for the upper water layer in the firmament) and precipitation (returning to the lower water level on earth). Not only that but it points globally to the importance of the water under us which we use daily to drink and wash. Consider the zone between the water below and above. We’d refer to this as humanity’s environment. This too was brought into existence with its intricacies including the setting up of the essential oxygen, nitrogen, and other gas cycles so necessary for life on earth. As I write this post headlines are screaming about a possible underground lake of water on Mars. We are searching for planets with water… that’s important but what we really need is a water cycle. Otherwise, how are we going to grow crops? Oceans are regulators of the carbon dioxide-oxygen cycle so we have enough oxygen to breathe. Oceans absorb 50% of the carbon dioxide. Just having water… with no cycles is useless to sustain life. Oxygen and fresh water are the most vital elements for survival, physically, a lack of oxygen will kill us within a few minutes, lack of water rapidly causes dehydration and can cause death in a few days. In preparation for the arrival of humans, breathable air and potable water, these two physical musts, were regulated on the second day. The movement and turbulence of hot air, its property of conveying water to the above expanse supplies us with precipitation, very timely and vital for our crops of rice, wheat, vegetables, fruit… Without getting into it now, lower water for drinking, cleansing and upper water for seasonal rains have fundamental spiritual counterparts of which I will remind you when we broach those subjects. Man’s most fundamental needs, both physical and spiritual, as we’ll elaborate shortly, light/warmth, air and water each with its own cycles, all with their intertwined cycles are summed up within these first 2 days of creation. Science and us know the mind-boggling intricacies, we can measure them and even try to make predictions about air and water cycles via meteorology with more or less success which only reveals our tininess, our petitesse in relation to these imposing, majestic phenomena. Science, however, cannot tackle the issue of where these INanimate phenomena, these brainless marvels originated nor how these intricate interrelated neuron-less processes were initiated and coalesced into a planet-wide synapse-less coherent system. Such a question, let alone the answer, is so far beyond comprehension that it is not even broached. Think about that. Are you hearing the words in the Bible? 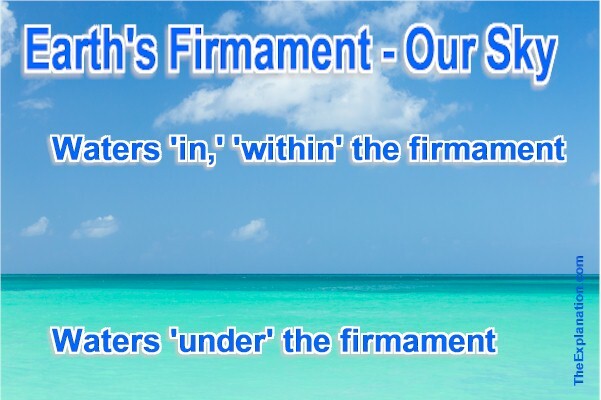 Genesis 1.20 shows us that the Biblical Hebrew word ‘al’ can be translated both with ‘in’ and ‘above.’ The reality is water is ‘in’ the firmament, Earth’s atmosphere. 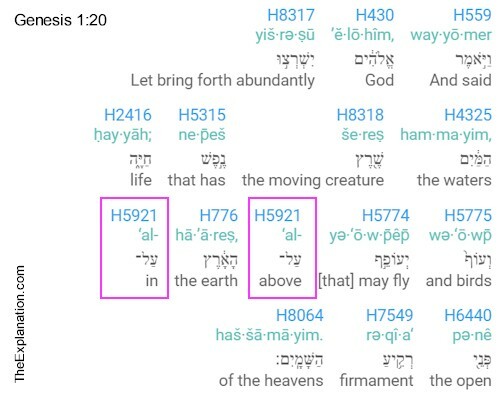 Genesis 1.20 reveals that the same Biblical Hebrew word ‘al’ can be translated as both ‘in’ and ‘above.’ The context clearly displays that here. The water is not above the firmament, it is in the firmament, the expanse above Earth we call atmosphere or sky.